Twenty human keratins are resolved with two-dimensional gel electrophoresis into acidic (pI 6.0) subfamilies. 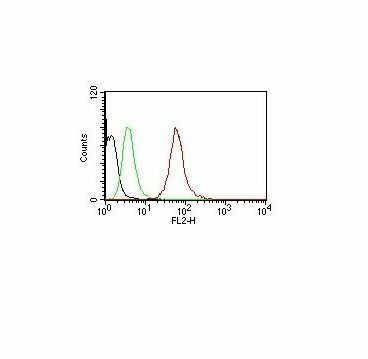 This antibody recognizes acidic (Type I or LMW) and basic (Type II or HMW) cytokeratins. Twenty human keratins are resolved with two-dimensional gel electrophoresis into acidic (pI 6.0) subfamilies. This antibody cocktail recognizes acidic (Type I or LMW) and basic (Type II or HMW) cytokeratins, which include 67 kDa (CK1); 64 kDa (CK3); 59 kDa (CK4); 58 kDa (CK5); 56 kDa (CK6); 52 kDa (CK8); 56.5 kDa (CK10); 50 kDa (CK14); 50 kDa (CK15); 48 kDa (CK16); 40 kDa (CK19). Many studies have shown the usefulness of keratins as markers in cancer research and tumor diagnosis. AE-1/AE-3 is a broad spectrum anti pan-cytokeratin antibody cocktail, which differentiates epithelial tumors from non-epithelial tumors e.g. squamous vs. adenocarcinoma of the lung, liver carcinoma, breast cancer, and esophageal cancer. It has been used to characterize the source of various neoplasms and to study the distribution of cytokeratin containing cells in epithelia during normal development and during the development of epithelial neoplasms. 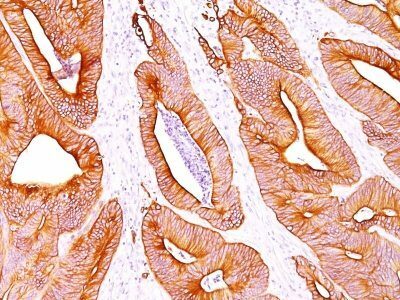 This antibody stains cytokeratins present in normal and abnormal human tissues and has shown high sensitivity in the recognition of epithelial cells and carcinomas. Catalog number key for antibody number 0371, Anti-Cytokeratin, pan (AE-1 / AE-3) The prefix indicates conjugation, followed by the antibody number and size suffix.